Gainesville may lose to other schools individually on tailgating, bar scenes, football, but the aggregation of what Gainesville offers is why it’s one of the best places to enjoy a college football game. It’s the least Southern of any SEC school, but the staples of SEC football are still all around. The locals and alumni can talk serious football with anyone, although they may take a few breaks in the middle of a conversation to fawn over Tim Tebow. Gainesville holds up well when people rush the town for a college football weekend because it’s big enough to have the requisite infrastructure with hotels or rental apartments, transportation, restaurants, and bars. Most of your time will be spent just north of campus and Ben Hill Griffin Stadium (aka the Swamp) along University Ave, but there are things to do “downtown” as well. Finally, it probably has the best weather of any SEC school, so you won’t have to worry too much in that regard. Florida’s biggest rivalry is with Georgia in the game no longer officially known as the “The World’s Largest Cocktail Party” in Jacksonville, but that doesn’t mean there aren’t good games on campus every year. Florida plays in the SEC East and recently the SEC determined its non-divisional opponents until 2025. (Or until the conference expands again…) The Gators get to play home games in the Swamp against Ole Miss in 2016, Texas A&M in 2018, Auburn in 2020, and Alabama in 2022, but you don’t have to wait for those schools to find a good game to see. As you’d expect, tickets aren’t the easiest things to come by. 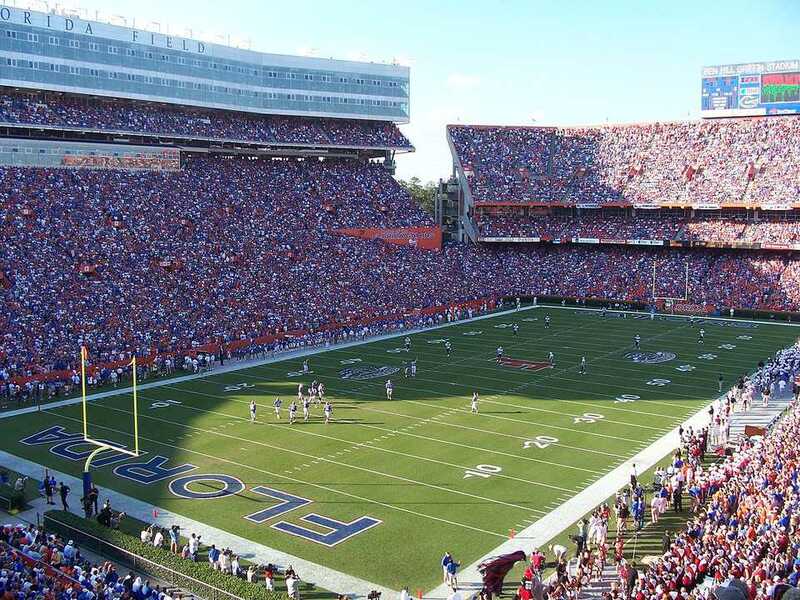 You generally won’t be able to find tickets on the primary market through the University of Florida because most tickets are sold to alumni or students. You’ll likely end up having to look at secondary ticket options like StubHub and eBay or a ticket aggregator (think Kayak for sports tickets) like SeatGeek and ‎TiqIQ. Craigslist is another option for deal-making but doesn’t have the same security of knowing you’re buying real tickets. You can also try working the tailgates or walking up and down University Ave. before the game to see if anyone’s selling, but it’s probably worth securing the tickets earlier if you’re traveling all that way. Gainesville is located two hours from Tampa, so getting there is very easy. Those within driving distance make it to Gainesville by car, but flying into Tampa and driving from there is simple too. Tampa’s airport is big enough where you’ll be able to find flights from numerous cities in the United States or get there with one connection if necessary. Gainesville is also within a two-hour drive from Jacksonville and Orlando, three hours from Savannah, and five hours from Atlanta and Miami. You can also get bus service with Greyhound or Megabus from most of those cities. The best option for a place to stay in Gainesville is to rent an apartment because it’s a big enough town where there will be plenty of availability on game day weekends. You’ll be able to find cheaper places downtown or slightly more expensive ones closer to the stadium. The best way to look into renting a house is via VRBO or Airbnb. Hotels close to the action cost a large sum of money, but that’s generally the case with visiting any college town. The Holiday Inn on 13th and University Ave puts you in a great location, but those lucky enough to book early will pay close to $500 for a room. It’s easy enough to get places with a taxi as long as you give sufficient notice, so a place like the Hampton Inn downtown might be a better option. There are a number of cheaper hotels that are less convenient and comfortable located on 13th St south of Archer Road. Gainesville has a silly rule where you can legally drink on the campus side of University Ave on game days, but you can’t drink on the non-campus side. Those from out-of-state pay a higher fine than those who live within the state and cops are trolling the wrong side of University Ave looking for people to give tickets to. They’ll also get you walking to the stadium as the unofficial rule is you’re good until you start walking. As for where to tailgate, there is no congregated area like Ole Miss’ Grove or Alabama’s Quad. An ideal location is just north of the stadium, but those spots close to the “Gator Walk” get taken early. People generally look for any open grassy area on the campus side of University Ave and set up shop and you’ll find your typical tailgate atmosphere with food, drinks, and games. If you want to avoid the sun, head near the Library to the Plaza of the Americas. To make things easier on yourself, call Gator Beverage and have them deliver a keg to wherever you’re staying during the weekend. If you’re very lazy, you can get the help of Tailgate Guys to set up a full tailgate for you. Gainesville has its staples for food just like any other town. Everyone locally knows about Hogan’s Great Sandwiches and that’s because it’s a simple place that knows how to give you a favorable meat-to-bread ratio. The #1, aka the Italian, is the one most people decide on, but the meatball sub always gets the job done. Fans of beer will enjoy the wide selection of options to pair with their sandwiches. The other staple in town is Burrito Bros. Taco Co., which serves burritos big enough to keep you full for a whole weekend. The only way to order your burrito is by making it a “primo” (to add more of the main ingredients and sour cream) and make sure to get a side of the fresh guacamole to accompany it. Pork gets my vote over chicken or beef, but people are generally happy either way. Some say Satchel's is the best pizza in Florida. Either way eating it in an old Volkswagen van makes the experience pretty cool. The best late-night pizza in town comes at Italian Gator Pizza, which is open until 2:30 a.m. to satisfy those leaving the bars late. It’s a unique situation with the pizza being served out of a tiny window next to Jimmy John’s. Leonardo’s also makes a decent slice, but they close by 10 p.m, so get there early enough to take down some garlic rolls with your pizza. If pizza isn’t your late night food of choice, check out Flaco’s for a Cuban sandwich, although they serve other Cuban food as well. Blue Gill Quality Foods has an awesome list of craft whiskeys and tequilas to go with the short ribs and ham-filled mac 'n cheese. Downtown has some options as well. Dragonfly was a favorite of Ryan Lochte (the simple swimmer who graduated from UF). The sushi and cocktails hold up well at one of the fancier restaurants in the area. If you feel like getting after it with your burger selection, head over to Balyhoo Grill where they’ll put the burger in between two grilled cheese sandwiches. Those looking for steak might end up at Mark’s Prime, but your expectations shouldn’t be too high. There are a few options for barbecue with Adam’s Rib Co.
providing local fare and 4 Rivers Smokehouse delivering the chain option. Finally, your breakfast interests should be satisfied at Ivey’s Grill. You might have to wait to get in and service isn’t lightning fast by any means, but the potato pancakes are something you’ll write home about. As you’d expect there’s a divide between a younger and older bar scene with the action closer to campus being more dictated to students. The Swamp, however, is great for those young and old on game days as it's one of the most well-known college bars in the country. There are lines down the street on football weekends, but you’re guaranteed to find a lively atmosphere at any time as people enjoy the outdoor patio. Salty Dog Saloon offers 50 beers from 50 different countries and those who can sample them all get a free t-shirt. The Grog House offers “Beat the Clock” Fridays where pitchers start for a quarter at 9 a.m. and increase in price every fifteen minutes. The pitcher special brings people early and the bar fills up quickly as the college crowd enjoys to grind on the dance floor all night long. Other places like Balls (all you can drink for ~$7 from 6-8 p.m.), 101 Cantina, Tijuana Flats, Gator City Sports Grille, and Fat Daddy’s get crowded on weekends and offer plenty of life. Tall Paul’s Brewhouse has local and hard-to-find brews for you to enjoy. There are also three breweries in town: Alligator Brewing, First Magnitude, and Swamp Head. :08 (aka Eight Seconds) keeps the country music crowd happy. As with every town, Gainesville has Irish bars as well in the name of Durty Nelly’s and Lillian’s (slightly more upscale). Rockey’s Dueling Piano Bar offers live music in the form of a piano bar, which is a type of bar embraced nationally these days. There are also clubs like Fubar, Envy, and the Vault plus “Techno Tuesday’s” at 101 Downtown if you stick around for a few days after the football.